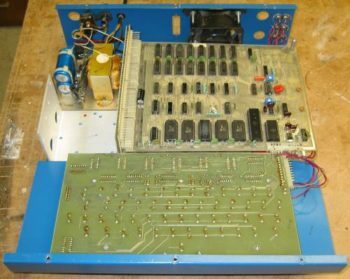 Prior to (and along with) building the Challenger 1P / Superboard machine, OSI produced several models of computer in the form of multiple boards which plug into a bus. 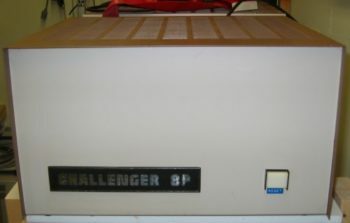 The Challenger 2 models consisted of various configurations from a single board (using a serial port to communicate with a terminal and with on-board RAM) to a system featuring separate cards for the CPU, RAM, video, and floppy-disk interface. 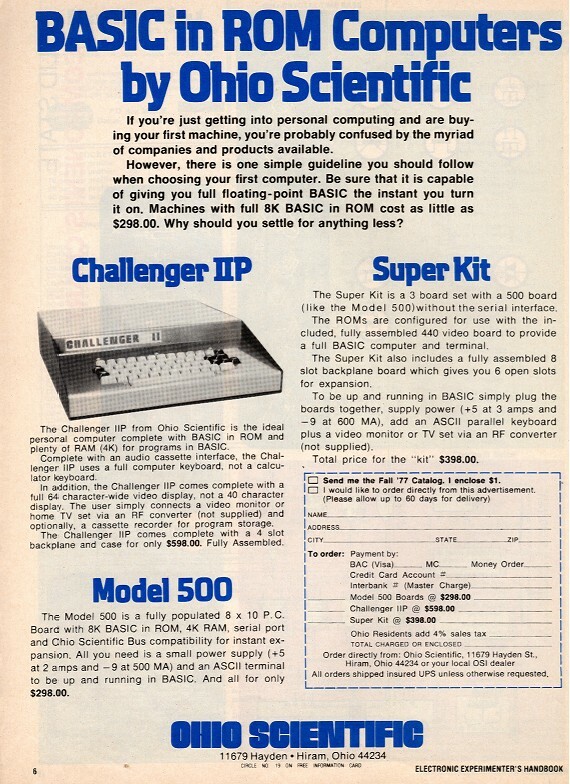 OSI went even further to produce a Challenger 3 series which featured three CPUs (6502, 6800, and Z-80) and even a model with a Winchester (hard) drive: a rarity in any personal computer system in the late 1970’s. 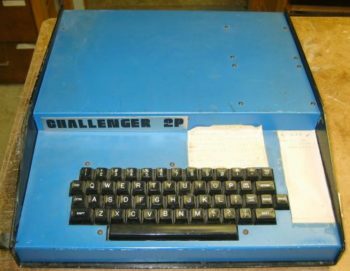 There is also a confusing bit of nomenclature here as OSI often labelled their Challenger 2 systems as “Challenger 4P” and “Challenger 8P” when, in fact, they were really simply “Challenger 2 – 4P” or “- 8P” … this was evident when one looked at the front of a box branded “Challenger 8P” to find the model number “C2-8P”. So, you’ll often see people refer to an “8P” but really, it’s a Challenger 2 – 8P”. This 1978 Ad from Popular Electronics is an early advertisement for 500 series systems including the 500 single-board and C2 systems based on the model 500 CPU board coupled with a video card. Pricing is in $US but at the time the exchange rate for $CDN to $US was almost 1:1 anyway. The smallest Challenger 2 system is the 4P, circa 1977. This system is composed of separate boards including a 502 CPU board, a 540 video card, and a keyboard all mounted in a thin case. With a newer graphics card than older systems, featuring a whopping 2K of video RAM, a 64-by-32 character display was supported. The system featured a four-slot backplane (hence the “4P” designation) of which only two cards were installed in the basic (cassette-based) system allowing further expansion with RAM and floppy-controller cards. The “2P” label identifies this as an older unit (originally branded “2P-4”, later “4P”). The system was twice the cost of the superboard but featured three-times the video capability and used the OSI standard 48-line bus allowing easy expansion via plug-in cards. You’ll note the 502 CPU card, shown here as the top card in the backplane, features five ROMS (BASIC as well as the monitor, just like the superboard) and 8K of RAM in the form of sixteen 2114 chips. The CPU board also contains a 6850 ACIA used for the cassette interface. The later superboard, then, is really just a 502 board with an integral video section as well as integral keyboard (with a significant cost reduction in the process). I had received this system in late 2008. It featured the usual bugs expected with an older machine (including power supply issues in the form of failed electrolytic capacitors) as well as a failure in one (or more) of the upper 4K of RAM chips. The on-board RAM was clearly expanded after production as the upper 4K are manufactured by a different company than the lower 4K (which was presumably installed by OSI). Removing the upper 4K of RAM, the system boots! The user is presented with the customary “C/W/M ?” boot prompt and, upon booting to on-board BASIC, a 64-character display appears … perhaps the best enhancement of such a system over the Superboard. A simple POKE command allows the user to switch between the default 64-character wide display and a 32-character wide mode … presumably for software compatibility with many games. You’ll note the lack of a disk boot “D” option on start-up. The 502 CPU board had on-card BASIC ROMs as well as 8K of RAM but lacked a floppy controller – it was intended as a cassette-based system only. Upgrades to include a floppy disk interface were, of course, possible by adding a 470 floppy controller card and more RAM in the form of another card (as well, the monitor ROM must be changed – most owners at this stage would have upgraded to CEGMON anyway which gave the Disk-boot option). This would have populated all four slots. As well as the cassette-based 4P configuration above, OSI shipped a system pre-configured for floppy disk in the form of the “4PMF” version for “mini-floppy”. That version used a 505 CPU which lacks on-card RAM but features a disk controller on the CPU card. Such a system usually consisted of a 505 CPU, 527 memory board, and 540 video card leaving one slot remaining for expansion. The next largest system is the Ohio Scientific C2-8P as pictured to the left. The one pictured to the right is how a full-blown system would have appeared (including eight inch disk drives). 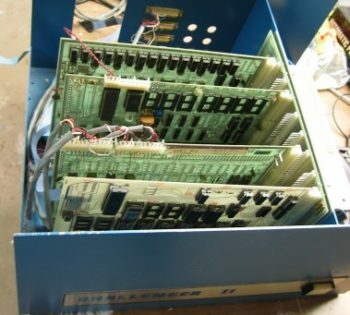 This older machine (several years before the Superboard II above), packaged in a big blue box, features separate boards for each function like the 4P above however includes a larger expansion box and an 8-slot backplane allowing greater expansion. The 8P was intended as a machine for research, educational, or small business use. I have not tested this unit yet, but intend to work on it as a ‘long term’ restoration project. 500 CPU (with 32 2102 SRAM chips for a total of 4K of memory on the CPU board) – circa 1977. The model 500 CPU card is seen here plugged into the backplane. The CPU is the large chip near the top left and the empty sockets are for optional ROMs (for languages such as BASIC). Also visible are the thirty-two 2102 memory chips at the bottom of the board – totalling a whopping 4K! The 500 CPU board was originally used in older “Challenger 2” and superkit systems and was replaced, in future 8P systems, with the 505 CPU … this is an odd system using an older CPU card but with an updated memory card using the newest (in 1981) 2K memory chips! As well as the cards in this machine I also have a few spare cards for the unit including a 505 CPU card plus one populated and one unpopulated model 470 floppy controller card (with parallel printer port). It is interesting to note that the system includes a sixteen port serial card (useful for multi-user systems) and a third-party, non-OSI built memory board. A unique machine, this Challenger 2 system is housed in a single, elongated (deep) box – physically it resembles the 8P (below) however the box is twice as deep. 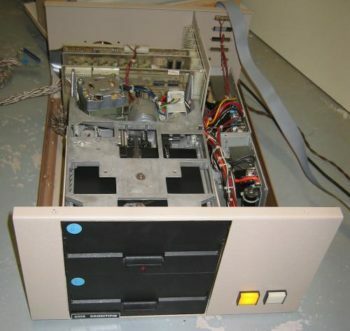 It features two 8″ floppy drives and has no video card: only a serial port is provided for connection to a serial terminal. 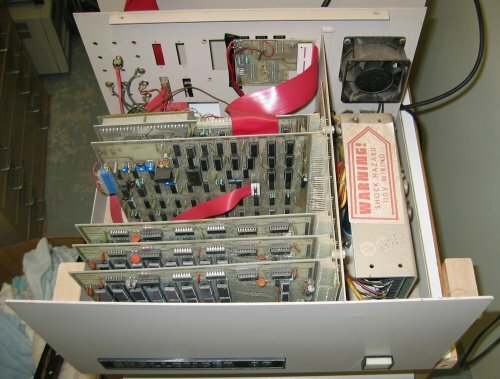 The system consists of an 8-slot backplane mounted immediately behind the floppy drives with a 505 CPU, 535 memory card, and a 470 card (used only as a parallel printer port in this system). The 505 CPU has an integrated floppy controller, a single serial port, and a single ROM socket which bootstraps from the disk (the boot options with OS-65 are “H/D/M” since the system could accomodate both floppy disks as well as a hard drive). The system had minor bugs when powered-up, primarily a short of the 24V supply used to power the floppy drives. The units has two physical power supply modules: one provides +5V to both all cards and the floppy drives, as well as +15V and -12V to the backplane and the second provides +24V for the floppy drives alone. The problem turned-out to be two dead capacitors on the Siemens FDD100-8D drives which were essentially a dead short across the 24V line (dead electrolytic capacitors are unfortunately common on old equipment). Replacement of these capacitors was straightforward, the control circuit board was re-mounted on extra spacers to keep the drive pulley from touching the board (as it did the first time it was powered), and the system booted perfectly …. the system runs OS-65U and OS-65D. On a family vacation to Halifax I picked-up this beautifully-maintained Challenger 2 – 8P Dual floppy machine. 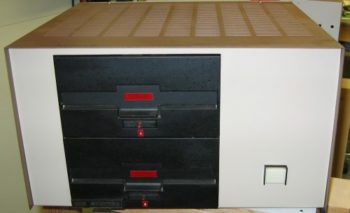 Circa 1979, the unit has a 505 CPU and three 16K memory boards – five of the eight slots on the backframe are occupied. Impressively complete, the system had all disks and manuals. You can see the Insides of the system as well including the three 520 memory cards near the front of the unit, the 505 CPU at the rearmost slot, and the 540 video/interface board below that. The system features two eight-inch drives (Siemens FDD 100-8 drives) in a box the same size as the CPU and connected via a large ribbon cable. When booted, the screen prompts “H/D/M ?” … unlike the single-board system this one does not have BASIC-in-ROM on the CPU board (hence the lack of the ‘C’ cold-start option). BASIC is run from the disk. The system was is great shape but has the usual problems for a system thirty years old, namely dirty drive mechanicals and loose connectors and chips (chip creep). After a quick cleaning the power supplies were disconnected and output voltages verified to ensure the old supplies would not toast the boards (Old supplies sometimes have old capacitors which fail causing the output voltage to go well beyond that expected – I’ve seen an old 5V supply producing 7V). Supplies were reconnected and the system booted. At first, the screen showed random characters but after some ‘wiggling’ of connectors the system was made to boot, once, from the eight-inch floppy drive and was able to perform a ‘DIR’ as seen on the screen shot to the left. Booting is not reliable yet so a bit more work is likely required on the system – either the drive mechanicals are marginal or perhaps simply all that is required is a recalibration of the electronics (the 470 controller has several analog potentiometers). Since I now have a working 8″ drive on the OEM machine, diagnostics and calibration should be trivial. Check the power supply first to ensure the voltages are correct – I have seen an old ‘5V’ power supply putting-out over 7 volts! After that, power-up the system and check for video output: lack of video output might indicate a problem either with the 540 video card or with the CPU card. Checking the CPU card is simple enough: First, though, determine which CPU is in use. The common CPUs available were the 502 (for a ‘BASIC in ROM’ system like a C4P) and the 505 (for a floppy-based system since the 505 has an on-card disk interface). Aside from the disk interface, the biggest difference is the clock – the 502 has no internal clock. With a 502 board the CPU derives its clock from the OSI bus which is supplied from the 540 video card (which must be installed in this case), with a 505 board an on-card 4MHz crystal is divided by two sections of a 7476 JK flip-flop for the CPU. Either way, a clock must appear at pin 37 on the 6502 chip (phase-0) before anything else will function. With the CPU functioning, the address bus should show a great deal of “random” activity which may be seen on a scope or logic probe. If the CPU card is running, check the video card – specifically check the waveform of the control lines on the 2114 RAM chips used as video RAM (the two 2114’s closest to the character generator ROM) on the 540 video card. 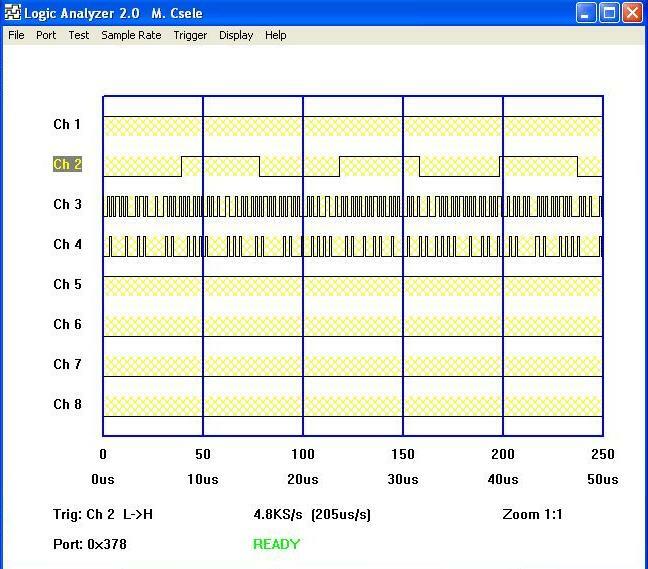 Using a logic-analyzer, or a scope, monitor the /WE (pin 10 on the 2114) and /CS (pin 8) lines as the RESET key is pressed. During a RESET (pushing the key on the front panel), one should see a series of write operations to the RAM … this is how the OSI clears the screen to remove the random ‘garbage’ which appears on power-up (random RAM contents, displayed as ASCII characters). Note that address lines are always active since they are also used for read operations during video display. As well as a reset, pressing a key on boot-up such as “M” (to enter the monitor) will cause a write to the RAM and in the monitor pressing a key such as “0” or “1” will then cause another write. Verify this and it will assure you that the CPU is running properly. In the above logic-analyzer output, channel 1 is wired to /WE pin, channel 2 to /CS pin, and channels 3 and 4 to address lines A0 and A1 respectively. When the CPU is running normally, no write operations occur (channel 2 was triggered here since channel 1 is always high). Only read operations take place during data display and, as expected, there is a good bit of activity on the 2114 chip address lines. It might be noted that the video RAM must be relatively fast: it must be rated at 400ns or faster (i.e. the chips in these sockets will not work if they have a “-5” suffix as this indicates a 500ns chip). Use of slower chips may not allow proper data read/write and so strange patterns may appear on the video screen.